Besides the obvious of winning races and setting fast laps one of the major things that differentiates one Porsche from another on the track is its livery; the colors and distinctive markings a team chooses to brand themselves with. When it comes to the more complex liveries, like that of the Team Falken Porsche, I always assumed they were wrapped front to back. Not only did it seem practical and less expensive, it just seemed the way to go in the event of accident or contact. However, according to a post we read recently on the team Falken Tire's blog we were completely wrong. They paint the car and repaint any damaged parts as needed. 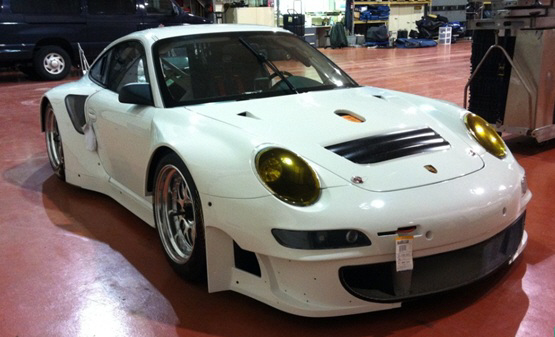 Read on and you'll see just how much is involved in getting their Porsche prepared. Since Falken Tire started racing in the American Le Mans Series in 2008, the team vehicles bore the corporation’s unique livery. The teal front end leads into a bold, blue rear, with Falken’s signature scallops on the doors and roof of the car. Here is a look at the intricate process of creating the look of the No. 17 Falken Tire Porsche. A new car arrives to the team in white, without team liveries or sponsor logos. If you look closely, here, the 2012 Porsche still has the shipping slip. 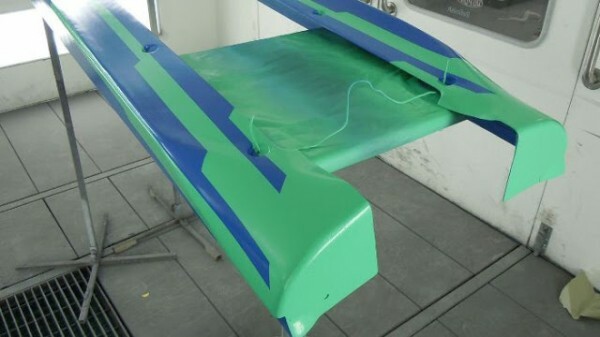 In order to create the Team Falken livery, every part of the Porsche receiving paint first gets sanded down. 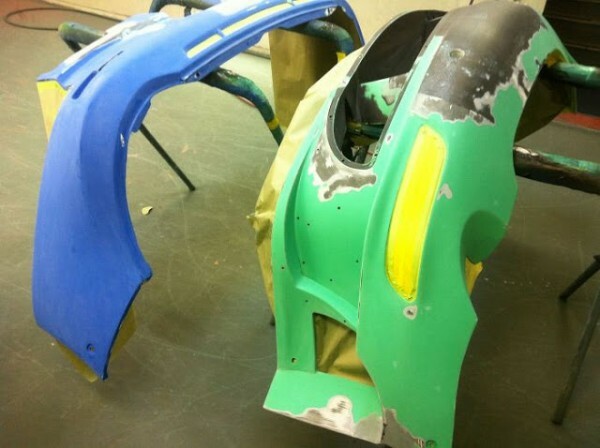 Once the factory gloss is gone, the new layer of paint will be smooth and stick to the body of the 911. Any area not getting paint is masked. 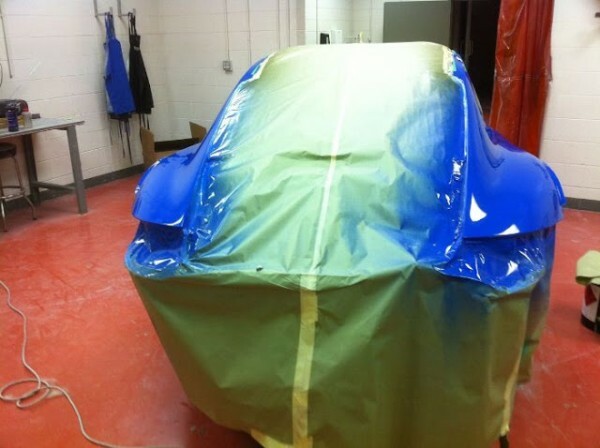 Since different parts of the Porsche get painted at different times, not all of the covering is applied at once. From start to finish, taping up the 911 takes a minimum of four hours. Body parts of the 911 are removed, and the teal layer is the first color applied to the Porsche. Once the teal dries, portions of the 911 are covered again to protect from the next phase of blue paint. 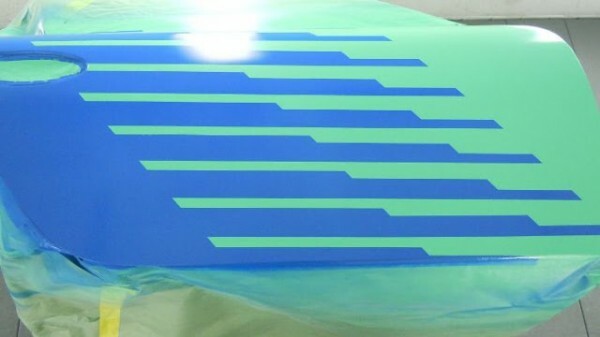 To create the Falken Tire signature scallops on the door panels and the roof of the Porsche, a vinyl mask is used when spraying on the blue paint. To keep the branding of the signature look consistent, the Falken Tire team provides the painter with specific guidelines of the car’s design. When applying the vinyl mask to the 911, the doors are put back on the Porsche to ensure the design stays even across the roof and doors. After the mask is applied, the pieces are then taken back off the car to be painted. Due to the Porsche's low ride height (50mm), the rocker panels below the doors suffer usual wear and tear, and need to be repainted often. 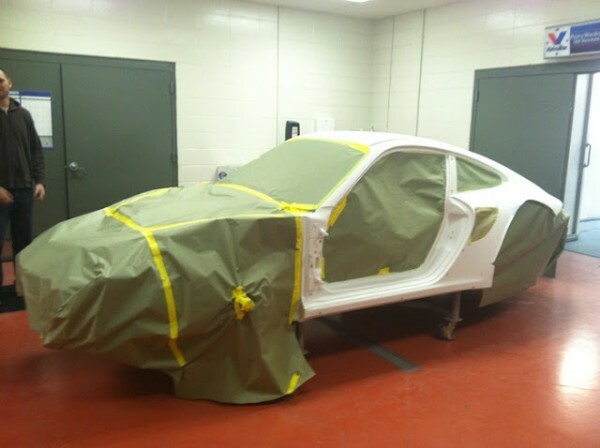 Once the colors are on the 911, the painter applies a clear coat to encapsulate the color and add shine. After an hour of drying, the bodywork is complete. If a piece of body work suffers contact, it gets repaired, sanded down, and painted again with the proper colorand clear coat. Here you can see some pieces of the Porsche after sanding. They are prepped and waiting for their colors. 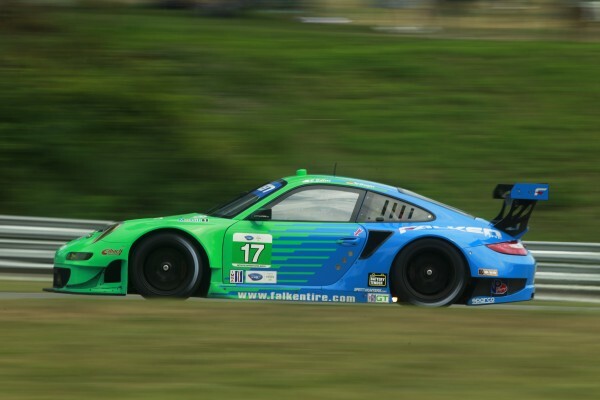 Once the Porsche is fully dry, all of the team and sponsor logos are placed on the car according to the specifications of Falken Tire and the International Motorsports Association. Each crew member’s helmet is painted by the same process. With the helmets, it's imperative that the vinyl mask is applied correctly and that the angles for the Falken scallops are kept the same. 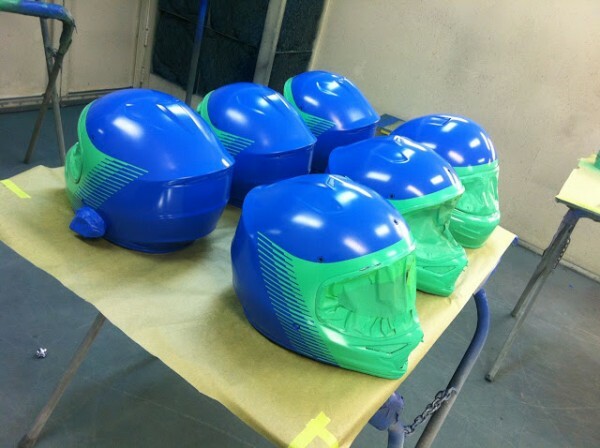 All of the helmets are painted at the same time, following the same process. Fascinating story. Personally, I am not a big fan of the Falken colors and graphics (they seem too 1980’s to me), but it is nonetheless a fascinating article. I wonder if, 25 years from now, they will be viewed as iconic Porsche graphics. Also, I wonder if the interior, engine bay and front underhood remain white. We’ve put the questions you asked about the interior, etc. to Falken. We’ll let you know once we hear back. I like the idea of craft as opposed to wrap, no doubt it’s far more expensive. I do like their tires. I have run azena 615’s on my 911 and I currently run Falken Euro-winter ice and snow high performance tires on my 986 Boxster, awesome tires! We can’t even imagine how much it must cost given the constant need for repair due to contact and accidents. Hell just the rocker panels alone must need to be repainted every race! The helmets are painted? With what: wouldn’t paint destroy the shell, as painting helmets is not recommended by the manufacturer. I’m sure they know that recommendation. How would painting “destroy” the shell. Think of Troy Lee Designs and all the paint work he does for all the big names (in many different sports) that utilize his services to paint their helmets. From what I understand, and admittedly I’m not an expert, the only danger in painting is if you were to disturb the inner shell as it is the part that gives protection. Assuming the inner shell is not tampered with, I can’t see how a thin layer of paint could “destroy” the integrity of the helmet. I’ve noticed that Bell helmets does not recommend painting by an independent paint, but on the other hand they offer painting as a service. Seems like a bit of a conflict?? I work for Falken, the cars are stored in the warehouse I work at from the mustang, 200, 350z, 240, 911 (2), RX7. You would be surprised how many bumpers and panels we have laying around the shop that could be be painted and used again that arnt cracked or damaged just some minor blemishes, pretty sure for the most part after so much cosmetic damage a new part is put on, I don’t think the cost of painting the body is any concern. We have a rack of the body parts that are cosmetically damaged and right next to it a rack of brand new painted and unpainted body parts. Are the two colors standard colors or are they mixed to spec every time? If I want to match the colors could I just go and ask for X Blue and X Green? I would love to see these on a surfboard!